The Idle Hour is a whiskey-barrel shaped bar in North Hollywood that recalls the glory days of novelty roadside architecture. By the dawning of World War II in Los Angeles, quirky commercial architecture was in full swing, particularly “programmatic” or “mimetic” design, which often meant a building’s facade actually resembled what it was selling. The style was ostensibly meant to catch the eyes of passing motorists cruising amongst LA’s ever-more-crowded roadside landscape. 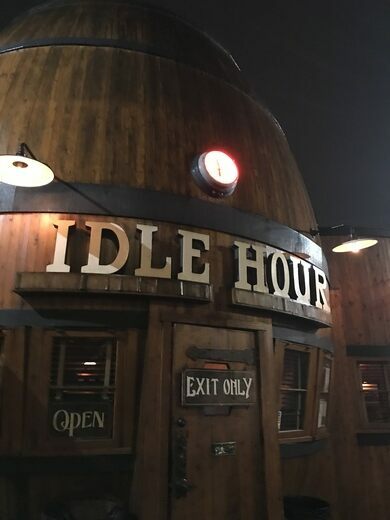 Universal Studios film technician Michael D. Connolly originally commissioned the Idle Hour Cafe in 1941 as a taproom in the form of a giant whiskey barrel, which was then built by engineer George F. Fordyk. It operated through the 1960s, then became the La Cana Flamenco dinner theater. With the changing owners and declining quality of the space the building seemed destined to fall into roadside ruin like so many other erstwhile edifices. However in 2010, it was designated as Los Angeles Historic-Cultural Monument #977. Thankfully, Idle Hour has been lovingly revamped and revived by the vintage-inspired bar-impresarios of 1933 Group. Now, the cedar whiskey barrel design is as good as new. Original stained glass on the ceilings and doors are still in place, with reclaimed ceiling planks on the floors and photos of other programmatic buildings on the walls. There’s a fire pit on the patio, along with a reproduction of another novelty gem in the form of a pipe-smoking canine that pays homage to the Bulldog Cafe, itself in operation from 1928 until the mid-1960s. Today, it serves as Idle Hour’s private event space. Still, it’s the whiskey barrels that will make you hit the brakes. 4824 N. Vineland Ave. in North Hollywood, at the corner of Lankershim and Vineland.